Capacity 220 lbs. - Each - SHIPS FREE! 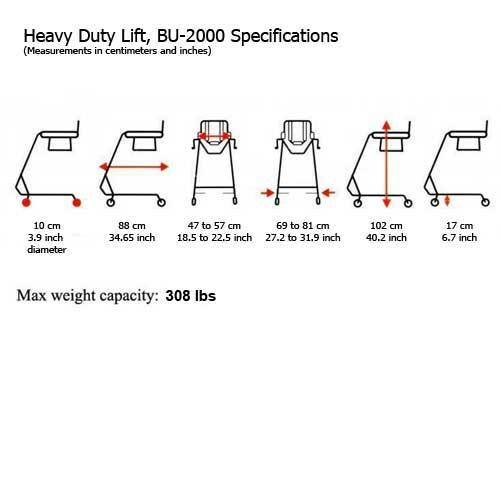 Capacity 308 lbs. (heavy duty) - Each - SHIPS FREE! 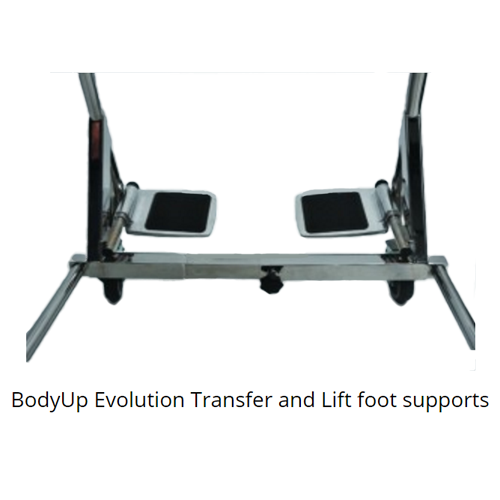 Body Up Evolution Patient Lift Chair offers a safe means to transfer patients. 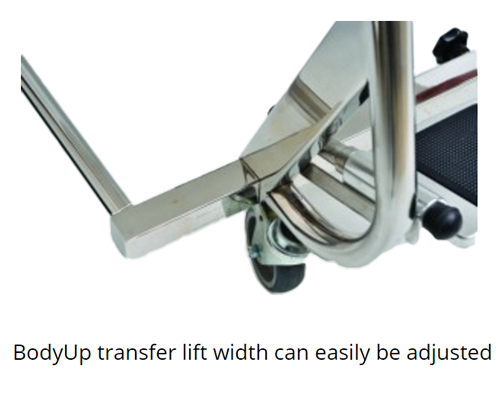 Designed as a 4-in-1 medical transfer device, the Body Up Evolution Heavy Duty Lift is constructed of stainless steel to serve as an all-purpose bath chair, commode chair, indoor wheelchair or car transfer chair. 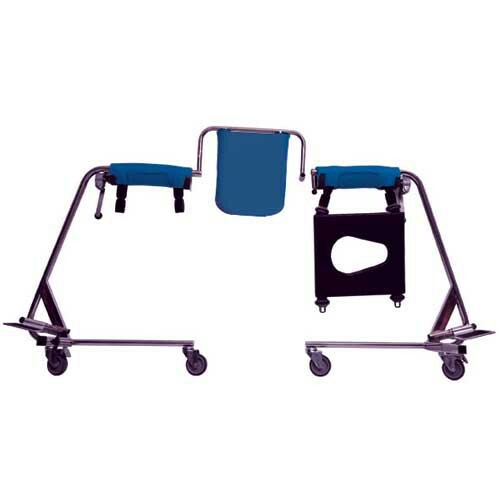 The Body Up Evolution transfer lift chair can be used with the Commode Cushion (BU-05) to use as a commode chair. 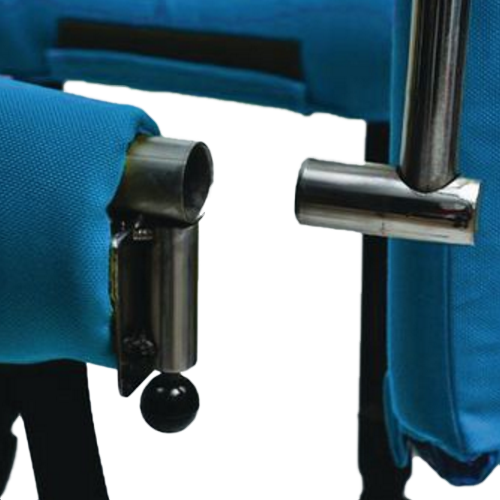 A soft Comfort Cushion (BU-09) can be used to convert the chair to a transport wheelchair for indoor use. Another accessory is the Body Up Transfer System Stabilization Straps (BU-03) used for patient safety. 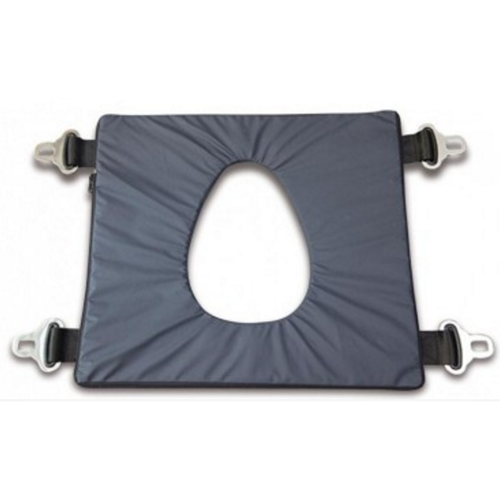 The stabilization straps keep the sling cushion attached to the body of the sitting patient. 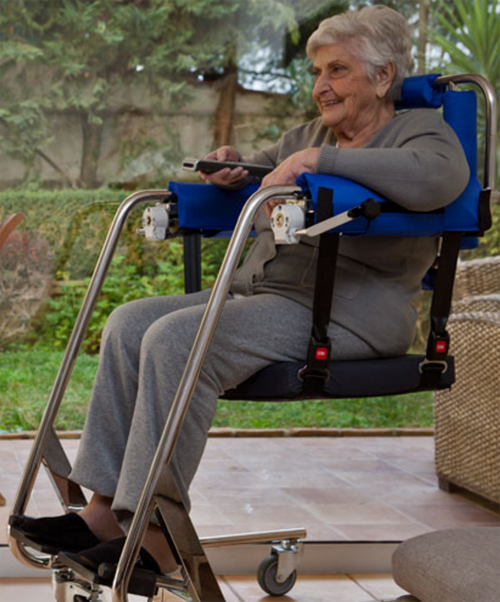 Body Up Patient Lift can be used to transfer patients by a manually lifting mechanism that employs a simple hand crank to hoist the patient from the surface they are sitting on into the lift chair. The chair requires no electricity or batteries. The transfer chair limits the after-sales service calls and associated fees common to most lift chairs. Its waterproof construction makes it a perfect commode or bath transfer chair for patients. 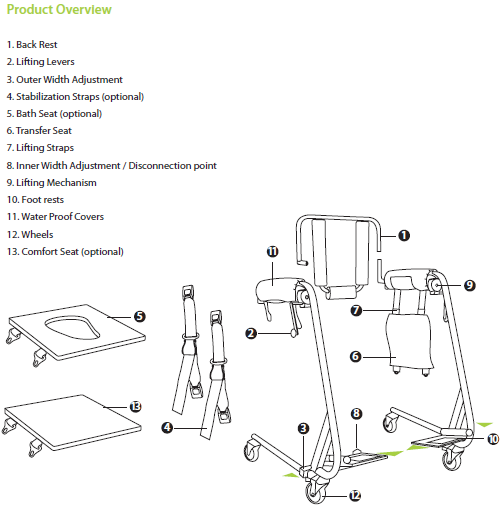 Listed below are some key uses for the Body Up Evolution Mobile Patient Lift Transfer device. The Body Up frame cover is removable and machine washable. The transfer sling is hand-washable and is made of waterproof polyester. This multi-functional aid provides a safe lift and painless descent to help prevent injuries to the patient as well as the caregiver. Constructed with high quality stainless steel. Requires no electricity or batteries. Add the tray table accessory to allow desktop/tabletop use. Disassembles into 3 separate pieces for easy storage and transport. Requires no muscular strength to operate. Reduces stress to patient and caregivers. Limits “after sales service” calls. Provides safe descent and painless lift. Special gears and levers make the lifting and descending procedure simple and easy. Physical strength is not a requirement for using the Body Up Evolution Patient Lift/Transport. Requires low maintenance and it is easy to clean. No need for a battery. Its light construction allows you to carry it with you in the car. Raises patients from the bed with ease and dignity. 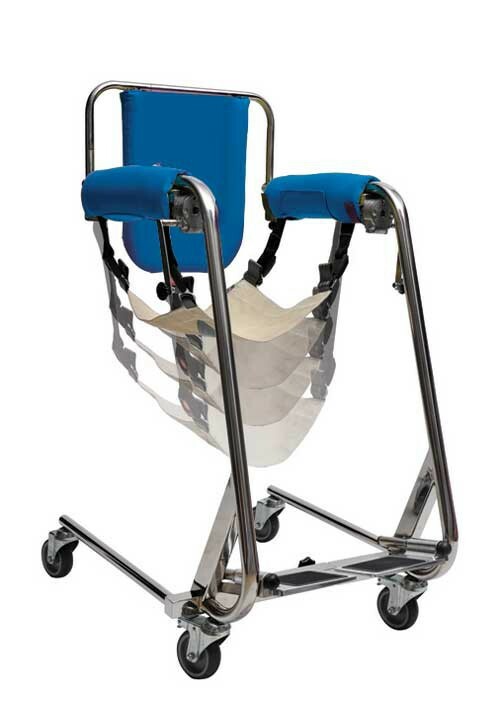 Designed to lift patients from the bed while their body maintains its natural sitting posture. Easy to fold into two pieces to transport. Width (outer): Adjustable 27 to 31.7 Inch. Seat Width (inner): Adjustable 18.5 to 22.5 Inch. Base Width Adjustments: 24 to 28.7 Inch. Height, Floor to Arm: 40 Inch. Wheel Size: 4 Inch Casters. Transfer Sling: Waterproof and hand-washable. Base and Back Support: Detachable. Stabilization Straps (BU-03) - provide additional stability to patients who require additional support. 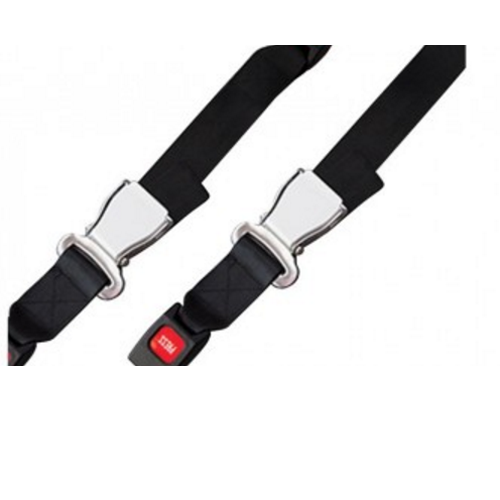 With a design similar to automobile seat belts, these straps have a quick release button. Patients stay safely centered in the sling when these stability straps are properly used. 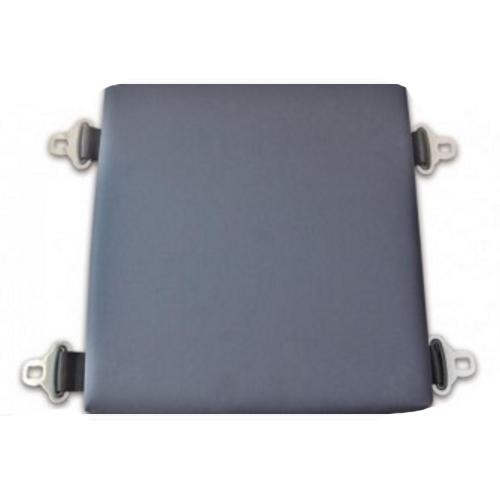 Comfort Cushion (BU-09) - designed for patients who use the lift as a wheelchair or for long transfer periods. This cushion is made with a polyurethane gel layer and additional foam for a more comfortable experience. Commode Cushion (BU-05) - offers patients easy access to toileting, bathing or showering. Manufactured with silicon gel, the seat is comfortable and allows patients to use the toilet without leaving the lift. 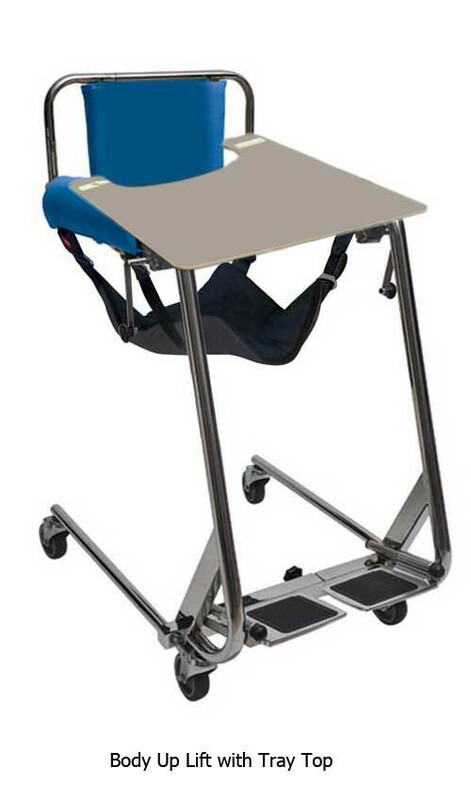 Wheelchair Tray Table (STDS5050) - adds the convenience of a desktop/tabletop to the chair lift. Swivel Cushion (BU06) - attaches to transfer sling or comfort cushion. Allows Patient to Easily Turn. 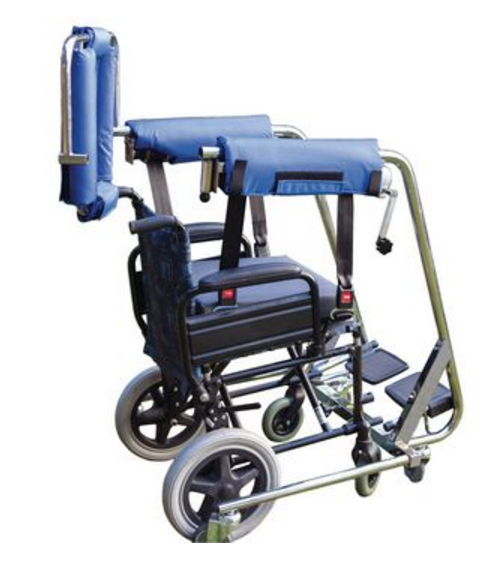 Product Brochure provides features for this 4-in-1 mobility device. 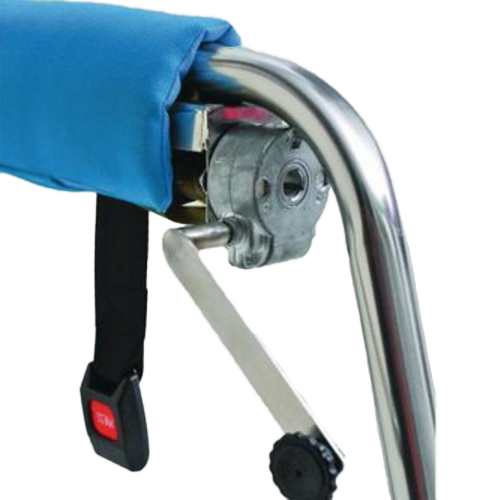 Accessories for the Body Up Transfer Lift Chair include the Stabilization Straps, Comfort Cushion and Commode Cushion. User Manual provides technical details, operation, maintenance and repair information. Easily lift or lower patients. Dual cranks to adjust patient height. Transfer patients from and to beds. Transfer to and from wheelchairs. Select from three different types of seats. 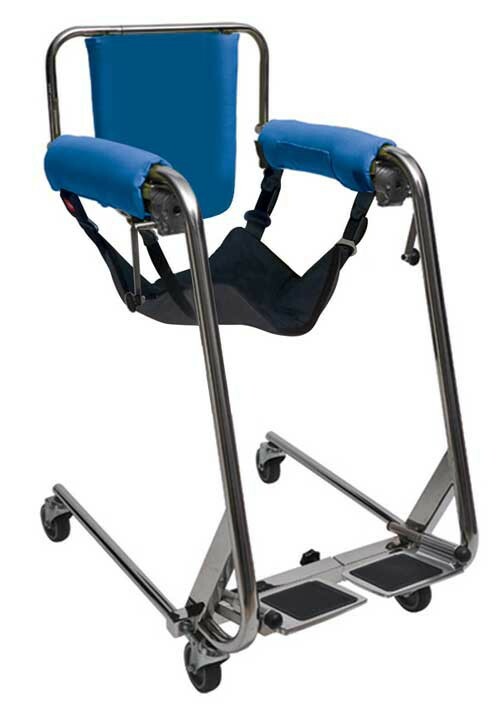 Stability straps available to keep patients from slumping or slipping from the lift. Constructed with high quality stainless steel that makes it water-resistant. Safely lift and descend patients to and from the bath tub. The Body Up Bath Chair makes bathing easier and safer. Using the toilet is made easy. Easily install the accessory commode chair cushion to convert to a commode chair. Toileting works best with the Commode Cushion accessory. Use as an indoor wheelchair. Use as a sofa on wheels! 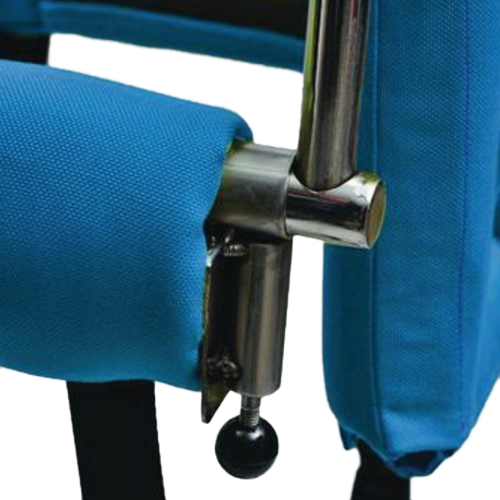 The external width can be extended for a comfortable transport chair. Serves as a backyard transfer chair. Makes vehicle accessibility more feasible. Compatible with most medium and large size vehicles. Vehicle transfers work best with the Comfort Cushion accessory. Check the specification charts in the image carousel above to ensure that your car will match the specifications of the lift you plan to select. 1) Frame and wheels - 5 years. 2) Gear - 1 year. 3) Transfer (canvas) seat - 1 year. 4) Straps-1 year (with proper usage, explained in user’s manual). 5) Pads - 1 year (with proper/regular cleaning). Only original equipment and accessories should be used. When neglect and/or repairs through non-authorized persons occur, any guarantee of the lift and its components are rendered invalid. Product liability on the part of the manufacturer (Veziris HealthCare - M E Veziris OE, Iraklitou 119-121, Halandri, Athens) is excluded in these cases. The Body Up Lift will not work with every vehicle. To determine if this lift will work with your car you will need to take some measurements of the height and width of the car entrance. First, measure the distance from the ground to the top of the seat. Second, measure from the top of the seat to the top of the door frame. Third, measure the distance from the console to the door frame or in some cases the back of the seat, which ever distance is shorter. Fourth, measure the distance from the ground to the bottom of the door frame. 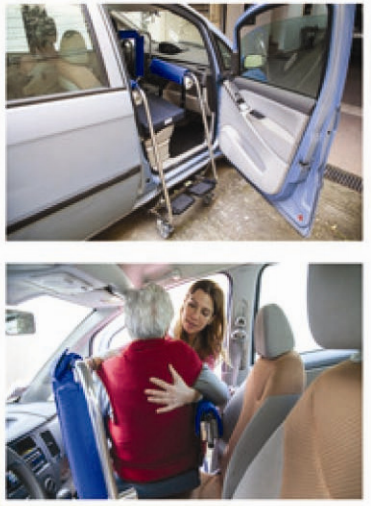 Then, compare your measurements with the charts below to ensure there is sufficient space between the opened car door and the door frame or seat to ensure that there is enough space to maneuver the lift and patient. 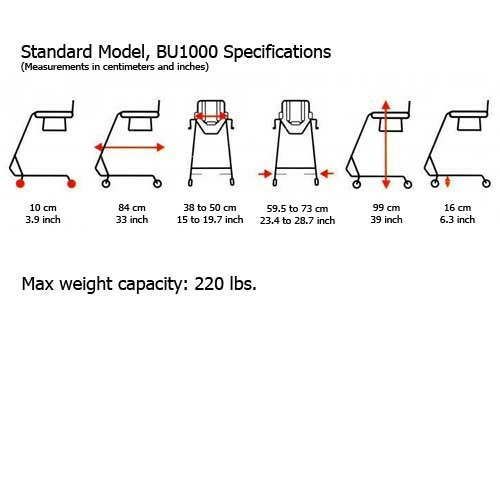 The chart below shows the measurement differences between the standard sling and the Comfort Cushion sling (purchased separately). The Comfort Cushion reduces the height by several inches giving you more clearance room for the patient. Measure the Door frames: BU1000 needs 24 inches to move through door frames easily and the BU2000 needs 27 inches. Measure the Gap Under the Bed: BU1000 needs 6.20 inches of clearance under the bed. The BU2000 needs 6.70 inches. Consider Back Support: patients who have back support will require one caregiver when using the Body Up Evolution. Patients with limited back support will require two caregivers for safety. This product is not ideal for patients with no back support. Does the Body Up Evolution lift roll on carpet safely ? The wheels are designed to safely transport patients on carpet but always take extra precaution just to be safe. It depends on your insurance company. I would suggest calling your provider and asking about your coverage. We don't accept insurance payments, however, if your insurance covers this item, you may qualify for a reimbursement from your insurance provider. Hello Robin: Our Economy Shipping option guarantees an item will get to the address listed in 7-10 business days. Faster delivery options are available at a higher cost. Will it lift patient to sit in SUV? Specifically Jeep Grand Cherokee. Does Medicare cover any of the cost? Can they be rented? Thank you. The Body Up is able to lift patients into more lifted vehicles such as Jeeps. These cannot be rented. Regarding Medicare: In an effort to keep our prices low, we do not bill Medicare or insurance companies. Feel free to contact Medicare for information about reimbursement. How well does this work with large patients? Will it safely lift a 250 lb person? 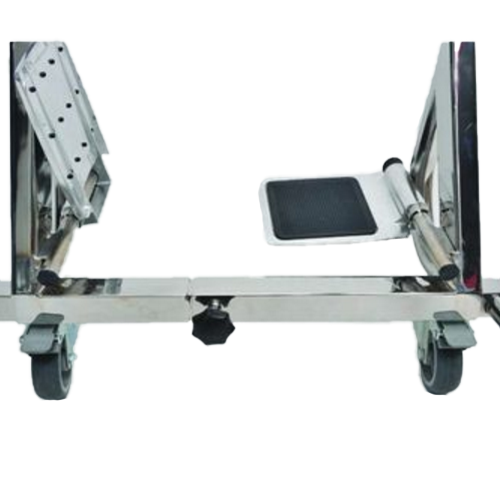 We sell a heavy duty option that will lift a person up to 308 pounds. Can you use the lift for a standard car? The lift can be used for any vehicle. This item is not available on a trial-like basis. Are the gears and levers replaceable should they break? The gears and levers have a one year warranty. If those pieces wear down or break within the year of the date of purchase, we can process a warranty claim for you on your behalf. Hi!!!! I want to know if this chair includes accessories or it's only a seat? The Body Up only includes the original seat that comes with each order. Accessories such as other seat types are separate. I watched the video and purchased this chair for my dad. It works great to get him out of bed onto his wheelchair and back again. But it is not so good for dining at the dinner table. The arm support bars are 40 inches from the floor and are too high to go underneath the table. I found some furniture risers on Amazon from a company called "Home-It" that lifted our table 8 inches higher and was able to get my dad to the table to eat while sitting on the lift. This made the table too high for the rest of us so I bought a smaller table to use with the risers just for my dad. It works great! The height of this lift chair is very accommodating for lifting from a commode, bed or wheelchair. However, that height works against you when using this lift chair at a normal sized table or with small cars. The design of the frame does not allow placing the sitting person's legs under the table as with a standard chair. A person sitting in the lift can be at a standard table for coffee or tea, but eating is not practical because they are sitting too far away from their plate. We have a tall breakfast bar that allows our grandmother to sit in the lift and eat, but the frame of the lift gets in the way when at a standard size table. Getting grandma into our Ford Explorer worked fine but not for our Toyota Corolla. The door frame on the Corolla is small and the space between the roof and the seat is minimal. If you plan to use this lift for car transfers, do not use the standard flexible seat that comes with the lift. Recommend getting the stiffer Comfort Cushion for easier car transfers. This is a great product. For so long, toilet transfers and shower transfers were awkward, painful and dangerous. Not anymore. Toilet and shower transfers are comfortable and safe for both patient and caregiver. Does not rub skin or cause abrasions like other similar devices. Everything worked great, then I tried a transfer to a car. I had noted a review that it would not work with taller vehicles, I have a RAV4 so I did not expect a problem, but there just wasn't enough room to get him into the seat while sitting on the lifter. The RAV4 required the additional purchase of the comfort seat that does not sag like the default seat. It is still a tight fit and takes a bit of time to get them into the seat but it works! I think that smaller cars would be a much bigger problem, particularly if the person you are lifting is unable to do much assisting on their own. Recommend measuring the clearance room for both width and height of the car entrance and comparing those figures with the specifications of the lift you intend to purchase to ensure you have a good match. I read the reviews to help make my decision. I'm glad that I made this purchase. The body up is so easy to use and worth the cost. If you've used a patient lift, it's a big pain. This chair got rid of our lifter and our shower chair. It's nice not to have to keep all that in the bedroom. 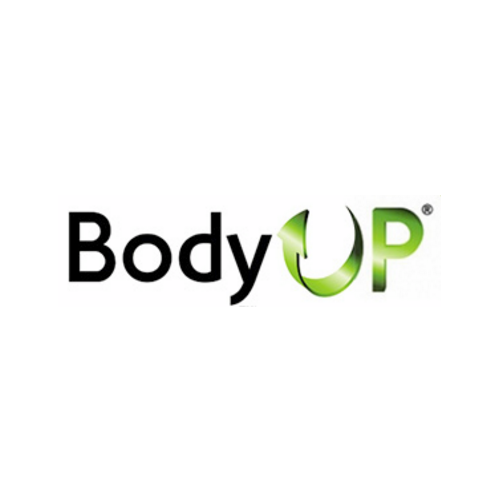 I would recommend the Body Up to anyone. It's really been helpful and convenient for me. I love this product. I ordered it for my mom and I can't tell you how helpful it is. I'm not able to lift her well, so she was spending too much time in bed and it was hurting her skin. Now it's easier to get help her and her life is a lot better.